Here you will find information and sample code for develop against Telldus Live! In order to get started, please see our php example implementing the API. You can also test the API right in your browser using the API explorer. A new beginning… Telldus Live! v3! Behind the scenes we have been working on a new version of Telldus Live!. We have had the vision to create a better and more up to date web interface for quite a while, and while releasing many new features in the app during 2018, we have been simultaneously working on the new web. We now invite you to try it out! For the development we are using variations of React ( React and React Native) for both Telldus Live! v3 and the app. This way we can offer new features for both the app and the web in a much easier and faster way than before. Telldus Live! v3 is a work in progress and many features are still not available. But as we continue the development you are very welcome to try it out and tell us what you think. We value your feedback! Telldus Live! v3 is currently only available to test for our Premium users. Go to https://live.telldus.com/v3/beta to take it for a spin! Previously when an API function returned an error it responded with a (developer) friendly message saying what went wrong. This is all good but has a couple of drawbacks. 1) This was not always user friendly. A developer may not just show this error to the user since it may confuse him/her. 2) It's not easily translatable since the source text may change, breaking the app translation. 3) If the app needs to perform a specific action depending on the error it must parse the error message string. The same as number 2 above. It has been a much requested feature to add an error code to the responses as well, so now we have done this. The specific error code is unique and specific to that type of error. For example, in addition to "Not found" (1) the specific code might tell the developer what resource could not be found. The specific codes are documented individually for each endpoint and can be found in the API explorer. We've finally finished the development needed to integrate Google Assistant a.k.a. 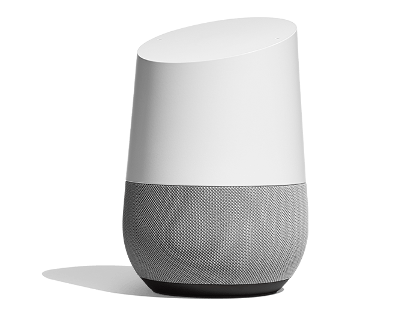 Google Home with Telldus Live!. Now we've sent devices to Google for testing and certification, so lets keep our fingers crossed and hope the tests succeeds! Update: We have passed certification and the integration is now live. Currently we require a premium account to activate this. 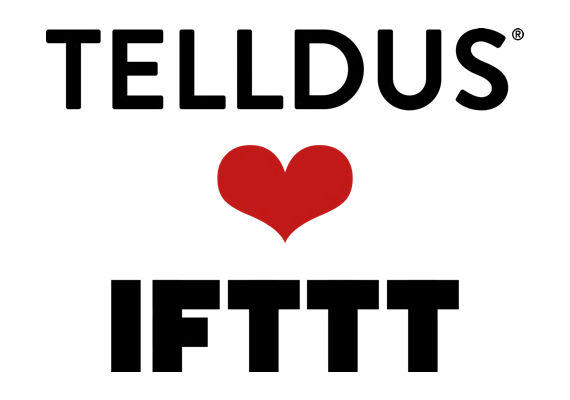 Regarding recent connection problems that started on Tuesday we would first like to say that everything is now fully working again. We noticed the issues just before noon on Tuesday and directly put all efforts towards solving the issue. More or less the entire day from that point was spent trying to troubleshoot and resolve this. Our servers are located on several data centers to minimize the impact if one data center is experiencing problems. Unfortunately, this time, the monitoring systems did not detect any problems with the servers which is also the reason that it took some time to make the connection to that specific data center. Late Tuesday night we moved our servers to another data center which made the service available again. On Wednesday we received a call from our hosting provider who takes full responsibility for the issues. During a network update in one of their data centers some ports were blocked, which affected the traffic to our servers. Only a few of their customers were affected, unfortunately Telldus was one of them. It took a while for them to locate the network issue and resolve it and they are still in the process of analyzing the reason behind it. After that process they will take measures to change routines to avoid this kind of issues in the future. Availability is top priority for us and we are continuously working on solutions to improve that even further. Specifically in this case we will investigate why our monitoring systems did not detect this particular issue. "I samband med en uppdatering av nätverksfunktionalitet i ett av våra datacenter så blockerades trafik på en standard port för virtuella nätverk. I vår riskbedömning inför uppdateringen hade vi inte noterat att det här var en känd risk, vi kan inte se någon rimlig anledning till varför den här spärren existerar så hanterar vi det som en bugg i mjukvaran och arbetar med vår leverantör för att reda ut det. 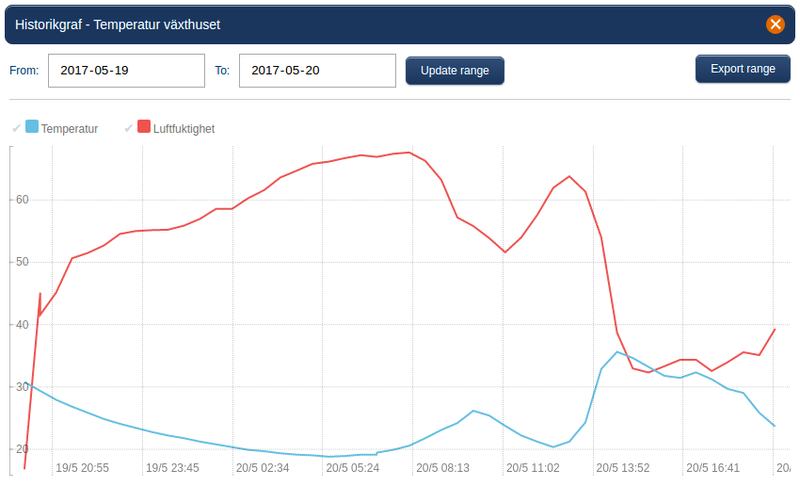 Analysen kring varför det här hände är inte klar så kan vi inte dra några större slutsatser ännu. Felet var svårt att lokalisera eftersom det drabbade ett fåtal kunder. Vi jobbar på att reda ut hur vi kan förändra våra rutiner för att kunna identifiera liknande problem snabbare i framtiden." On Wednesday, March 21st, Telldus Live! will switch over to a new database system. We don't expect any downtime, but it's a really major operation involving many steps with a lot of potential pitfalls. The switch itself will take place at 11:00 CET. We will then closely monitor all systems and fix problems that may show up. Follow us on twitter (@telldus_status) for the latest updates. In a worst case scenario we might have to rollback to the state before the switch over attempt. In that case, editing made during this time would be lost. Also device logs (sensor logs are not affected) and new locations, schedules, events and accounts would be affected. Therefore we encourage you not to do a lot of editing of your setups this day. We are doing this to increase database performance, but especially to have a more reliable failover design. Almost all other Telldus systems are using this database in one way or another, and it's critical that it's reliable. We in Telldus take Security very seriously. As soon as information about the Drown and Poodle attacks on SSL was published, we started to examine the affects and the resolution to these issues. With this message we would like to assure you, that apart from Security, user satisfaction is one key foundation defining how we work. This is also one of the reasons, we are delayed with the resolution. To deal with these vulnerabilities, we had the option to close down TelldusCenter and support you to instead setting up Telldus Live! via our new TellStick Gateways. That would mean swapping the old TellStick with Version 2 of our Gateway. This is in our opinion the best option for you who are using TelldusCenter, and in the process also get to the optimum security and feature set that we today have. In short, we want you to not be left behind but walk with us towards a safer, more secured Smart Home Solution as compared to the old version. But we haven’t closed down Telldus Live!-access for TelldusCenter because we want to affect your running setups as little as possible, and keep your options open, therefore we chose to upgrade TelldusCenter. This is taking more time than expected due to the complexity and we are working hard to finalize these changes which we believe should happen shortly. Once done, these vulnerabilities will be removed. In addition to this, we have also decided on a few other Security updates and restructuring, that would allows us to better separate servers that needs to remain open for TelldusCenter from the others. These upgrades will also allow us to turn on https as default for the Telldus Live!-web. As some of you have noticed, there is a difference between servers regarding what SSL versions they accept. We are only using api.telldus.com for TelldusCenter and that URL is now considered legacy. If you are connecting to our API using SSL, you should use pa-api.telldus.com instead. We have recently started testing the possiblity to include a sensor value or device state in mail/SMS/push/URL-actions. An early version is out on the servers now, and by manually adding keywords to messages it's already possible to test this for Telldus Live! Premium-users. "The temperature in the closet is now [VALUE] degrees, time to do something about that!" = The temperature in the closet is now 45.5 degrees, time to do something about that! [UNIT] = Unit type for triggering sensor, for example "m/s" or "%". Note that only the states on and off are supported at the moment (not "dim" for example). The temperature was [VALUE][UNIT] at [TIMESTAMP] . We are currently internally testing the possibility to specify a device/sensorid if it's not the value of the triggering device/sensor that is wanted, more information about this will follow. Later on these keywords will of course be integrated in the UI on the webpage when adding an action. This is an early beta, so don't expect everything to work without glitches right away. All feedback is very welcome though! Also, again note that this is only available for Telldus Live! Premium users. 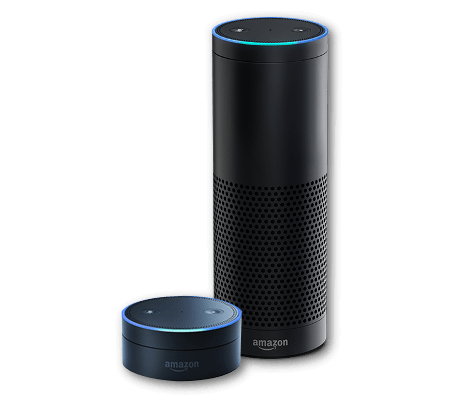 Amazon Alexa devices let you play music, control your smart home, get information, news, weather, and more using just your voice. It's the part "control your smart home" that is interesting to us. We are currently testing integrating Telldus with the Smart Home Skill in Alexa. 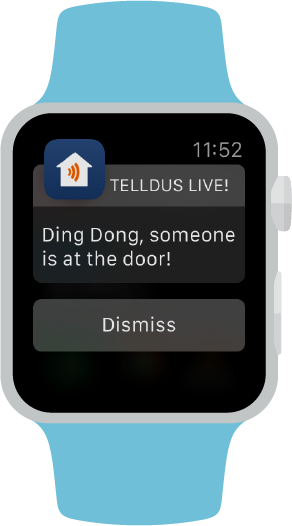 This allows you to control all your devices in Telldus Live! using your voice! Well, you get the picture. You can even initiate Alexa commands with "Computer, ...". As of now there is no actual self destruct sequence however, but some day we'll get there. Sometimes beta software is not stable. If you (or your family) prefers to have a stable setup at all time, you might want to stay away from beta testing. The closed tests for the new rewrite of the app is progressing well. A lot of issues has been found by the users and fixed by our developers. It's time for the next step, an open test! As always. Beta software are not always stable. If you (or your family) prefers to have a stable setup at all time - you better don’t get into BETA testing. Just would like you to know that we just pushed a small design update to the sensor history. We're now inviting Android users to test the app. We really care about having active testers, make sure you have some time available to play with the app and to provide feedback. A while ago, we released our IFTTT channel for our PRO users. Now it's time to launch it for all our Live! users. 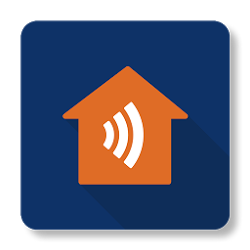 With IFTTT, you can connect a variety of online services such as Spotify and Philips Hue with each other. The possibilities are endless. Read more about IFTTT here. Finally! - Telldus Live! is now available in Norwegian! If you see any strange translations, please let us know. The Siren from Philio (PSE02) is sold as a multi sound device, but to make it play other sounds it has to receive a NOTIFICATION_REPORT. This report is normally sent out from a sensor such as a PIR or door/window-sensor. That means it's possible to e.g. play a Door Chime sound when a door/window-sensor is opened. When sending a SWITCH_BINARY_SET (which is the default command that will be sent to this device from TellStick ZNet) will only make it play the default emergency sound. In order to play other sounds, a NOTIFICATION_REPORT has to be sent out from TellStick - that can be done from a Lua-script. Each day more people from all over the world are discovering Telldus Live! We want Telldus Live! to be as welcoming as possible for everyone. That's why we want Telldus Live! to be available in your language. Maybe you can help us with this? If you are interested in translating Telldus Live!, we can offer you a Pro subscription for a year, and continuing as long as you keep the translations up to date. We are now especially looking for translations into Norwegian, Finnish and German, but other languages are also of interest. Telldus Live! 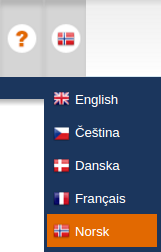 is already available in English, Swedish, French, Polish, Croatian and Danish. We are about to release the IFTTT channel. It will hopefully be released at the end of next week, if all remaining tests performed by IFTTT will pass. We will initially only release this for Pro users. Non pro users will have access to the IFTTT channel in may 2017. Q: My triggers are delayed before they are executed. A: This is due to how IFTTT works. IFTTT is requesting the status from our servers regularly. This means that the trigger can be up to one hour delayed. 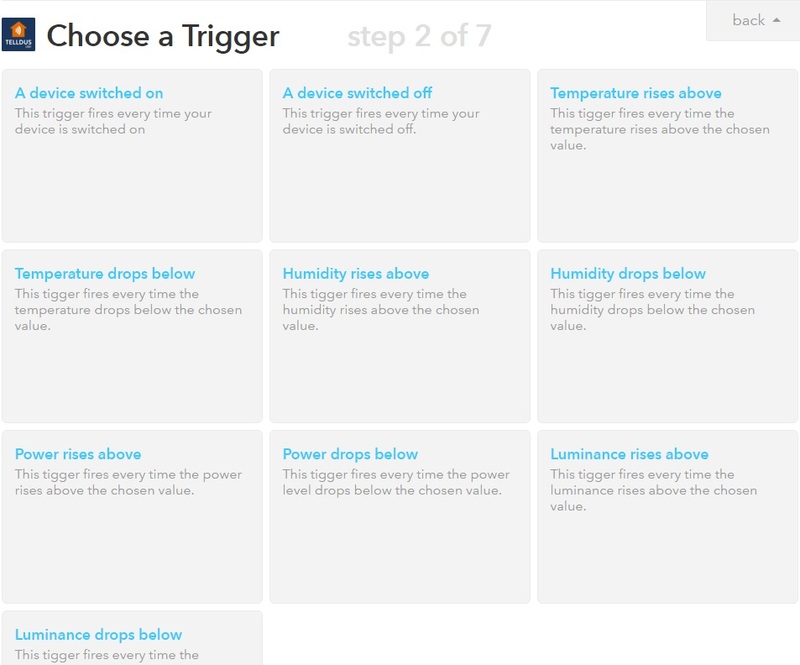 A: To get sensor triggers to work the sensor must have history enabled on it. Try enabling history on the sensor first. Q: My sensor trigger is constantly triggering while the temperature is above the threshold. I am getting a lot of notifications! A: For each value the sensor is over the threshold the trigger will continue to trigger. For a notification that only fires once, please use regular events instead. Update: The channel is now released. The Aeon Labs Minimote is a nice looking remote control for Z-Wave devices. It might be a little hard to understand the manual and the scenes and associations described though. This remote control does not support normal association where the main controller can set the nodes in association groups. Instead this is done on the remote control itself. 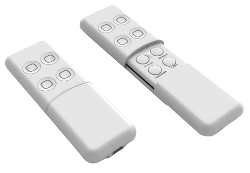 The remote control can only control devices that uses Switch Multilevel and Switch Binary, that means most dimmer and most on/off devices. Press and hold the button you like to configure - the blue led will flash after 1 sec. While still holding the button, make the device you want to control send out it's Node Information Frame. The blue led will stay steady blue. Set the dimmer level or the on/off-state you want the button to set. If patient then success. Finally Telldus+IFTTT=True! One of the most requested features we get is to connect to the popular service IFTTT. For a long time we have tried to convince IFTTT to connect their awsome service with us. They never replied so we asked you, our users, to also ask them. Our plan was that when enough people requesting Telldus support they might listen. And they did! 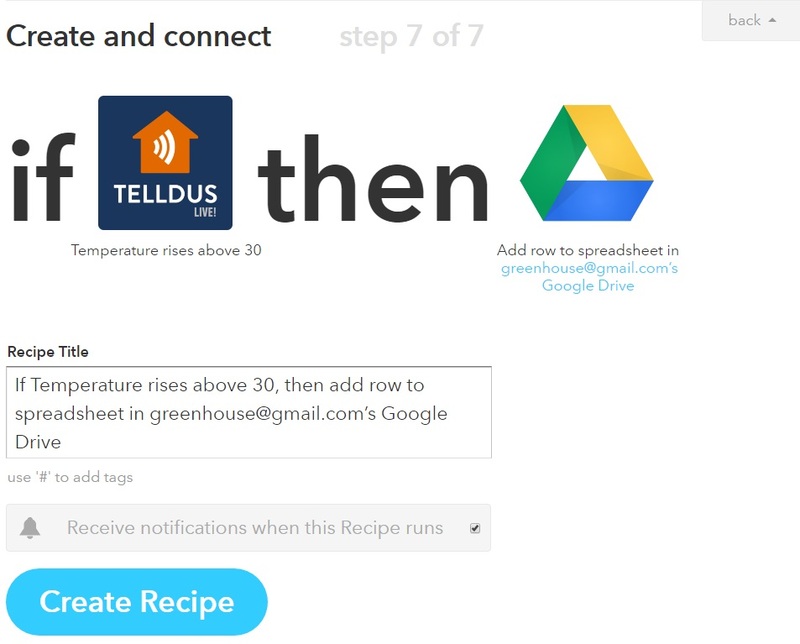 We are very pleased to announce that Telldus is getting a channel in IFTTT! What is IFTTT? IFTTT is a service that allows many different services to communicate with each other. 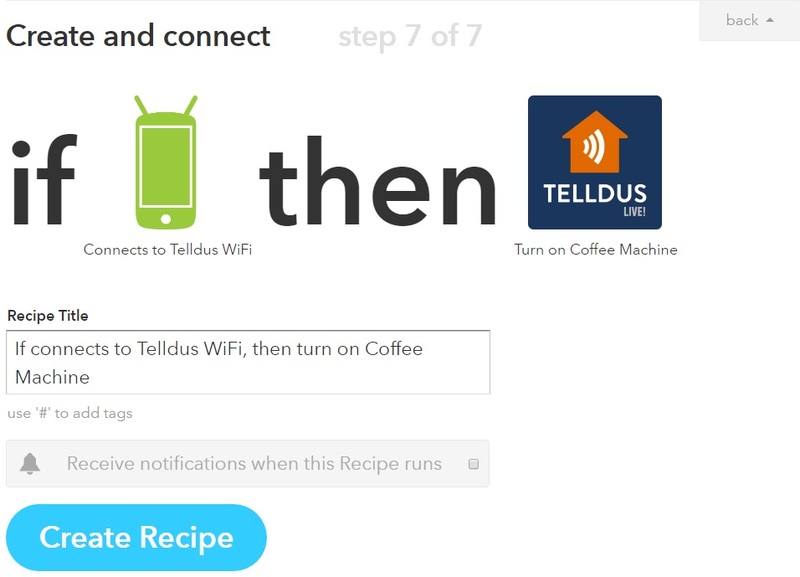 That means Telldus products will be able to control any other service also connected with IFTTT. At the moment I am writing this IFTTT has support for over 300 channels. So at once you can combine Telldus products with Philips Hue, SmartThings, Netatmo, Nest, and more! When an astronaut enters space, ring my bell. When I plug in my phone to the charger at night, turn off all lights in the house. Log my sensor data to a Google spreadsheet. When someone rings on my doorbell, tweet about it. When I leave home, lock my door. Since we are still developing this channel we are not yet ready to launch it yet. But we would really like to have some testers. We have reserved 50 spots in a beta test for this. Since there is limited number of spots in this test they will be reserved for Pro users. 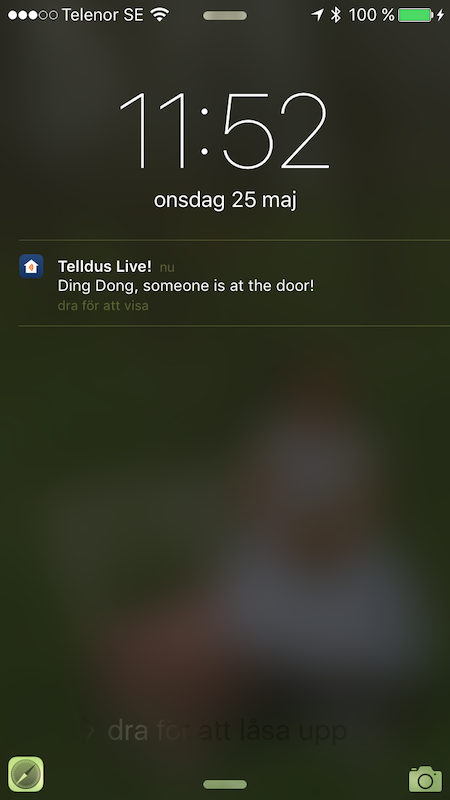 Push Notifications in Telldus Live mobile! Please contact our support if you encounter any issues or have questions about this or any other feature in our products.